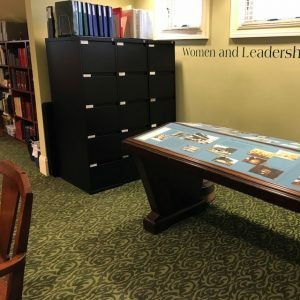 There is a lot of history stored here in the Women and Leadership Archives, so it would be easy to overlook the three black filing cabinets tucked away in a corner of our reading room. That would be a mistake, though, since those drawers contain the Mundelein College Photograph Collection. * In other words, they hold an estimated 40,000 photographs and slides (yes, you read that correctly) captured during Mundelein College’s more than sixty-year history. Much of the rest of the collection represents student life, events, and ceremonies at Mundelein. Several student organizations have their own folders. There are also files for recurring occasions, such as class reunions and annual dances. Finally, there are folders for some major historical events, like Mundelein’s involvement in the Civil Rights Movement. Images from the collection appear in past blog posts and on the Women and Leadership Archives’ social media, but even with regular updates, it will take a long time to get through 40,000 photographs and slides! That’s where my job comes in. 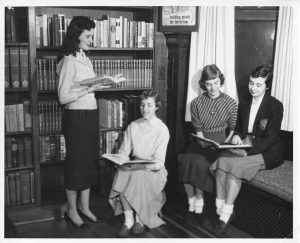 Over the past semester and half, I’ve been working with another Sesquicentennial Scholar, Tina, as well as our Interim Director and the University Libraries’ new Metadata Librarian, to digitize the Mundelein College Photograph Collection. We hope to use these photographs in projects celebrating Loyola’s upcoming 150th anniversary in 2020. Step one: Scan 40,000 photographs. Step two: Put them online. Right? Not quite. As Tina and I have learned, there’s a lot more to consider when it comes to digitizing. The main goal of the project is to make the digital photograph collection as accessible as possible. This means not just putting images online but making them as searchable as possible. That process takes a lot of planning and decision-making before the scanning even begins. As a result, Tina and I have been inputting metadata in addition to scanning photographs. Metadata is the information associated with each image. It includes fields like the date it was taken, the collection it belongs to, and anything written on the back of the photograph. When a person runs a search for a term, the search engine looks for matches in the metadata. For example, when the collection is publicly available, you’ll be able to search for every photograph taken in 1967, every image of Sister Jean, or every photograph in the Art Department folder. Or you can search for multiple keywords at once! All of this sounds exciting, but it’s easier said than done. With 40,000 images and multiple people working on the project, there are many opportunities for inconsistency, but it’s consistency in the metadata that makes searches reliable. One of our trickier issues was that many people went by different names during their time at Mundelein College. Some students married and changed their last name. Others went by nicknames. 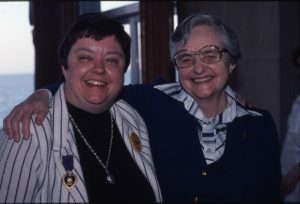 After the Second Vatican Council, which reformed several rules within the Catholic Church, women religious often went back to using their baptismal names instead of the saint names they took when they joined their religious order. For example, Margaret Thornton took the saint name Crescentia when she joined the BVMs, but later went back to her baptismal name. Before we started scanning, we had to decide which names to use under which circumstances. Having these naming standards ensures you will get an accurate set of results when you search the digitized collection for an individual. As the project continues, we’ll begin uploading images to Preservica, a digital preservation system where we can make photographs available online. We hope you’ll stay tuned as the project progresses and enjoy the photographs as much as we do! 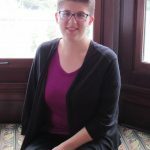 Hannah is a Sesquicentennial Scholar at the WLA and is in her first year in the Public History M.A. at Loyola University Chicago. She is originally from central Indiana and enjoys cycling, science fiction, and trying out new vegetarian recipes. She can usually be found in the nearest museum. 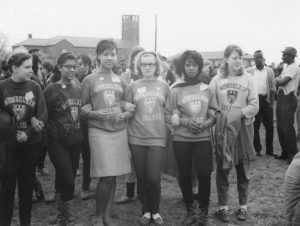 This entry was posted in Archival Practice, Digital Archives, Mundelein College and tagged Digitization, Mundelein College by Women and Leadership Archives. Bookmark the permalink.